Do you buy sweet potato seedlings? Or do you prefer to sprout your own sweet potatoes? I always thought of sprouting sweet potatoes as an elementary school project. But apparently that's what some gardeners do to plant their sweet potatoes. I guess that makes me a lazy gardener. I get my plants from a small, family-owned business in Tennessee that makes me smile every time I think of them growing my little Beauregards. Here's a picture of them, the folks who run the Steele Plant Company in Gleason, TN. "Everyone pictured here just hopes that you will send us your order this year so we can send you plants that will help you have the most enjoyable gardening experience you have ever had," says the literature I recently received in the mail. It comes printed on thin newsprint, like your local monthly shopper, with pictures of the storage house and the packing facility and one of the potato fields. There are also photos of the founders, W. Claude Steele, a produce man, and Dudley Sanders, a school teacher. According to the company's website, the two men started the business as a second source of income. It grew into a full-time affair that has lasted 56 years. Last year when I ordered I spoke to someone on the phone and he was pretty glum. The weather in Gleason had been cold and wet and they were just barely getting their plants ready in time for shipping. Steele Plant has at least six different shipping dates, tailored to different climate zones around the country. Along with onions, the company sells several different types of sweet potatoes, including white sweet potatoes and a deep red Japanese variety called "Taste of the Orient." This year I'll be sticking with Beauregard. We had excellent results with it last year (not so much with the white variety we tried). We'll be getting 25 plants, which should keep us in sweet potatoes for months. With each order comes a16-page booklet with four pages of growing and storage instructions and 12 pages of "prize winning recipes...cakes, pies, pudding,custard, casseroles, cobblers." This year we might even visit the annual sweet potato festival in Gleason, otherwise known as the "Tatertown Special." "This community affair draws thousands back home to their roots to renew old friendships and make new acquaintances," the bulletin declares. "Parades, old-fashioned Gospel singings, arts and crafts, and other activities make for a fun-filled weekend. You might even see Gleason's most famous citizen--Mike Snider, member of the Grand Ole Opry in Nashville!!!" Isn't it comforting to know that somewhere in America they are still holding an annual sweet potato festival? Thank you, Steele Plant Company. I will be dropping my order in the mail today. It's a little known fact that people all over the Caribbean love salt cod. And why would that be? In the not too distant past, the waters of the North Atlantic were swarming with cod. Going back centuries, when the fish were first discovered off Canada, fisherman from Europe and especially the Portuguese would make the long trek in their sailing boats to harvest the cod. Of course they didn't have refrigerators--refrigerators hadn't been invented yet--so they needed a way to preserve the fish for the sail home. They salted and dried the cod, making it almost impervious to spoiling. Salt cod traveled all over Europe as a valuable source of protein, especially in Portugal, Spain, Southern France and Italy, where eating salt cod is still a cherished tradition. But in the trade of that era, salt cod also went south--to the sugar plantations of the Caribbean--in exchange for sugar, molasses, rum. This week our "food appreciation" classes are in Jamaica as we continue our virtual world food tour. Here a popular finger food is a salt cod fritter popularly known as "Stamp and Go." Once the salt cod is cut into manageable pieces, soak it in plenty of water for at least 24 hours, changing the water at least twice. You might be surprised how much the fish looks like an everyday fillet after this soaking. It is even edible as is--just cut off a small piece and try it. To make the fritters, you will need a heavy pot or tall skillet with at least 1 inch of canola oil at the bottom. (Note: never fill the vessel more than half way for deep frying or it could boil over. If you have a deep-fat fryer, use that). Over moderate heat, bring the oil up to approximately 365 degrees, or a point where a bit of batter dropped into it will bubble vigorously but not burn. Prepare the fish by bringing it to a boil in a pot of water. Remove the fillets from the pot and set aside to cool. Meanwhile, in a large mixing bowl mix two scallions, finely chopped, 1/3 red bell pepper, finely chopped, and 1/2 habanero pepper, finely chopped. (Habanero or Scotch bonnet peppers are very popular in the Caribbean for their fruity heat. But they are very hot. Consider this optional, or use a less fiery pepper such as jalapeno.) To the vegetables add 2 cups all-purpose flour, 2 teaspoons baking powder, and salt and pepper to taste. Mix everything well. When the fish is cool enough to handle, flake it with two forks or with your fingers into small pieces, removing any bones, and stir it into the flour mix. Add a scant cup of water (or as much as needed) and mix to a thick batter. By this time the oil should be ready. Carefully drop spoonfuls of batter into the oil to form fritters about the size of golf balls. Turn as necessary until the fritters are golden brown and cooked all the way through. Remove to paper towels to drain. Serve these warm with your favorite spicy dipping sauce or simply dress them with malt vinegar. Follow with heaping plates of jerk chicken. Note: Hot oil is extremely dangerous. Be sure to keep it well out of the reach of children, and never leave it unattended. In our classes, we explain to the children why they cannot be near the hot oil. They make everything else up to the point where the batter goes into the oil. And of course they get to eat the finished fritters. Yesterday's post drew more than the usual number of comments. Rather than respond to each individually, I'm going to follow some of the threads that emerged. 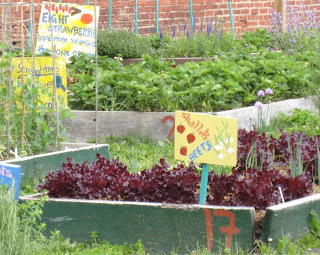 I am encouraged by the number of people who support the idea of treating community gardens more like collective farms. As expected, there are a number of gardeners out there who cling to the notion that the plots in community gardens should belong to individuals. They like the idea of doing whatever they want with their individual plots, to work a lot or a little, to plant what they please. To my mind, the difference is not so great as one might think. It's simply a matter of shifting attitude from what is "mine" to what is "ours." But the bottom-line question is this: Will the District of Columbia in fact embrace the idea of growing local food, or are we going to sit here like a potted plant and wait for the next shoe to drop? My personal view is, things are going to grow more difficult in the future, not easier. I can easily see a time when urban land--land suitable for growing food--will simply be too precious to give over to the leisure pursuit of puttering around a private garden plot. Growing food locally for people to eat will be serious business, not just something that certain people of means get to enjoy on Sunday mornings at the Dupont Circle farmers market. This is not a new idea and it does not belong to me. 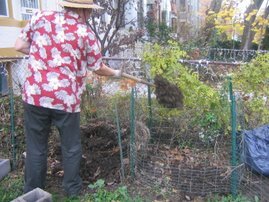 Some 20 years ago, the D.C. Council passed a law that called on the mayor to conduct an inventory of all the vacant land in the city and start turning it over to food producing gardens. The legislation also called for involving the city's youth in these gardens to teach them marketable skills. Apparently, the mayor at that time and mayors since then have found it convenient to ignore that law. We hear a lot about the city making land available for developers, for instance, but we hear very little about the city making land available for food gardening. Part of the problem may just be that we have not done enough to convince the public--or our public officials--that gardening is more than picking flowers, that gardening should be taken seriously. * The poverty rate for school children ages 5 - 17 in the District of Columbia is 51.3 percent compared with 34.5 percent nationally, the highest in the nation. This translates into 56,000 children at risk of hunger in Washington, D.C., or 1 in 2 children. * More than 57,000 D.C. residents live in extreme poverty. For a family of four, that means they live on less than $29 a day for all their expenses – including food, rent, and transportation. * 12.5 percent of households in the District of Columbia struggled with hunger from 2004-06. That’s an increase from previous years. From 2001 – 2003, just 9 percent were considered to be food insecure. * 109,000 D.C. residents are eligible to participate in the Food Stamp Program each month, however only two-thirds actually receive food stamps, and of those who do, 74 percent report that their food stamps do not last the entire month. * The average monthly Food Stamp Program benefit is $91.83. * Food access issues continue to challenge D.C. residents. Residents of Wards 2 and 3 have three times more access to supermarkets than residents in Wards 1, 4, 6, 7 — although the latter have a comparable or a greater number of residents. * At every supermarket in the District, foods with high nutritional value such as fruits, vegetables, whole grains, and dairy products are more expensive to purchase than highly processed and less healthy items. It has become clear, in fact, that cheap processed foods are a leading cause of obesity, diabetes and other life-threatening ailments, putting poor people at greater risk of disease and shortened life span because of what they eat. Does this mean that we can't plant flowers? No, I don't think so. Flowers attract pollinators to the garden and make a lovely border or even a solid bed that is pleasing to the eye. Flowers can be cut and sold at the farmers market to raise funds for the garden. But there are many opportunities to grow flowers in the city other than in the confines of a fenced community garden. Think pocket parks and street medians and tree planters and the beds outside apartment and office buildings and schools. Think apartment balconies and streetside containers and window boxes. 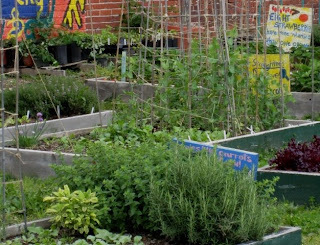 Does turning a "community garden" into a food-centric collective mean we can't plant fennel or broccoli rabe or any of our other favorite designer vegetables? Without getting bogged down in how a reformed community garden would operate, I wouldn't deny the leadership of such a garden the freedom to decide what kinds of things to plant. But in a world with many hungry mouths, I also think it behooves us to get a lot better at growing things like potatoes and beans and corn--things with a big caloric payoff--in addition to lettuce and collard greens, beets and spinach, kale and cabbage. And does sacrificing a bit of ownership and independence for a higher purpose take all the fun out of gardening? Anyone who has worked as a volunteer in a garden that was not his own can state categorically that it was still every bit as enjoyable and fulfilling. But most importantly, it is time to accept gardeing as a civic responsibility in this changing world and to press the powers that be in our city to start getting serious about making more public spaces available to grow local foods across the District on an organized basis. This is a matter of policy that only our local office holders can turn into a reality. But D.C. Urban Gardeners, as one of the few organizations of its kind in the city, is in a unique position to play a leadership role on this issue. With the entire culinary world pressing the Obamas to turn the White House lawn over to vegetables, we who know what our local needs are should do no less in our own public spaces. I urge all gardeners who are reading this to ask themselves what they can do to further this goal. Sources for this article: D.C. Hunger Solutions and the Capital Area Food Bank. Recently I was asked to consult on a possible new community garden in my neighborhood. The local parks and recreation department owns a 1/4-acre plot of land just up the street from my home that is being developed either one of two ways: a passive, walk-through public park with seating, or as a community garden with individual plots. A meeting was held at the nearby recreation center and a handful of would-be plot holders came out to vote for a community garden. I proposed something a little different: Instead of assigning individual plots, why not form a co-op that could operate this parcel more like a farm? Food production would be so much greater, I argued. It could be managed for eye appeal--no messy tangles of rambling tomatoes and squashes. Shares of produce could be distributed according to the work people put in, and a portion could be assigned to the needy as well. Pest problems could be eliminated with selective planting and crop rotations. The garden could be operated year-round. It could, in short, demonstrate to all just how much food can be grown on a small urban parcel. Well, I was nearly run out of there on a rail. "Sounds like the Soviet Union!" grumbled one attendee. "Is this how they managed those gardens in World War II?" This may not be how gardens were run during World War II (or maybe some of them were?). But then again, a few things have certainly changed in the last 60 years. There are more mouths to feed. Precious resources are dwindling. Urban areas certainly have been more built up: There just isn't as much open space available. What's more, we are entering times when pulling together as a community will be all the more important if everyone is to have access to healthful food. It's high time we start looking at the urban spaces that are available for food gardening as a collective resource. In the District of Columbia, there are some 30 community gardens spread across the city, most of them located in more affluent areas. Typically, these gardens are divided into individual raised beds that are assigned (usually for a modest fee) to individuals on an annual basis. Most gardens have a waiting list of people who are eager to garden and don't have a yard of their own. The problem with these gardens, as I see it, is that there is no control over what is planted in the individual plots. The gardeners are all on their individual learning curves. They may be growing a great deal of food, or very little. They may be planting things appropriate for the site, or they may not. They may be putting in a great deal of effort, or they may not be doing much at all, in which case the garden managers at some point are forced to take back the plot and assign it to someone else. It's a very inefficient system, as far as overall production is concerned. There are also horticultural issues. Not too long ago, I was asked to visit a community garden on Capitol Hill and give some advice on Integrated Pest Management. The plot holders had had problems in the past with nematodes. Now they were experiencing an infestation of cucumber beetles. They wanted to know how to get rid of the cucumber beetles. Well, I said, have you tried not planting cucumbers for a year? Or delaying your plantings to interrupt the beetle's life cycle? Those are two effective methods. But one of the garden leaders threw up her hands. "We can't do that?" she said. "We can't tell the other gardeners what to do!" There is a model for a more effective use of urban space here in the District of Columbia and that is the 7th Street Garden. This garden was started on donated property by two young women who saw it as away to address food security issues in an inner-city neighborhood. Since installing raised beds and trucking in loads of compost, they've been besieged by volunteers and started programs to get local residents involved in tending the garden and sharing in the proceeds. They sell the produce at local farmers markets and give gardening and canning classes to raise funds. The system I have in mind would work more like a Community Supported Agriculture farm. Most people think of CSA as a farmer who sells you a subscription to his produce, then delivers it weekly in a box. But there are actually many types of CSA arrangements. Some of them involve community residents actually purchasing a plot of land then hiring a farmer to manage it. The CSA members make collective decisions about how the farm should operate, and they are required to spend time working on the farm before they share in the bounty. Why couldn't such a system work in the city? Instead of assigning individual plots, elect a steering committee that decides what will be planted and when. Great use could be made of border fencing for growing beans and cucumbers and grapes and kiwis and other climbing fruits and vegetables. Space could be set aside for perennial vegetables such as asparagus and rhubarb. There could be room for small fruit and nut trees. Instead of puttering around their plots individually, members would receive work assignments and all pull together. In that way, many more people could be involved, sharing in a greater volume of food. It would become a community garden in its truest sense. And why do community gardeners walk away from their plots in winter? There's no need to, especially in our climate zone. The type of urban garden I envision could be growing a bumper crop of collards, kales, mustard and Chinese greens for the community straight through till spring. It's true what they say: root vegetables only get sweeter when they've been frosted over. For our cholent dinner over the weekend I foraged carrots and parsnips from the garden. They were planted last spring and have fully grown. I left them in the ground to make their own storage. The soil here in the District of Columbia is only modestly frozen, mostly near the top as a result of below average temperatures, down into the single digits at one point. For the second year in a row, I broke the handle on my forked spade prying the vegetables out of their beds. Last year I broke it trying to bury some kitchen scraps in my frozen compost pile. I have ordered a steel-handled spade. Cleaning up my carrots and parsnips was somewhat more involved than usual, since the garden hose has been turned off pending a thaw. I have to fill a basin of water in the sink and scrub by hand. They clean up pretty nicely. Then they are peeled, cut on an angle, tossed with extra-virgin olive oil, salt, pepper and thyme and roasted in a 325-degree oven. I swear, you will not find better root vegetable on any menu. So many methods of making pot roast are disappointing. The meat too often comes out of the oven dry and tough. I've settled on traditional Jewish cholent as our preferred method of cooking a piece of beef shoulder for a long time, braising it in a heavy pot with beans and barley. The result is something much more than pot roast, a gooey unctuous stew that goes straight to the soul and lifts the spirits on a cold winters night. 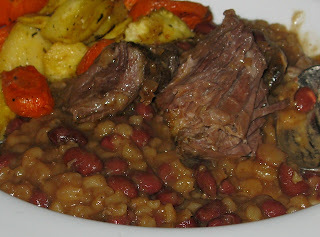 Traditionally, Jewish cholent was placed in a low oven just before sundown preceding the sabbath so there would be a warm, hearty lunch to serve the following day, when cooking was forbidden. I don't cook mine nearly as long--only five hours. Last night we had friends over to help us eat a big pot of cholent made with chuck roast from our dairy--South Mountain Creamery--as well as cranberry beans from our own garden. 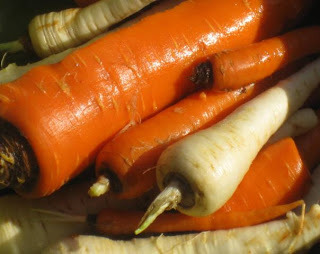 On the side were roasted carrots and parsnips pulled in the morning from the soil where they are overwintering. They are even more sweet and delicious having been touched by the cold. For dessert, my wife served an intoxicating, flourless clementine cake. Proof again that the simplest foods are the most satisfying. Do You Like Warm Yogurt? Now that we are making our own yogurt, I get to taste it in all stages of development. Bacteria are wonderful things. At least the bacteria that inhabit our yogurt are. They create a delicious tang from plain milk. When I was a youth living in Switzerland, many years ago, I remember my host father tasting and re-tasting a bowl of milk he had fermenting on the kitchen counter. I thought he must have an awfully strange sense of what is edible. But now I like to sample my yogurt even before it has completely fermented and thickened. After coming off the stove and having some of last week's yogurt mixed in as a culture, it goes into a Styrofoam cooler with some jars of hot water. Hours later it is still loose and warm but I love the feel of it when I take a spoonful. Have you ever tried yogurt warm this way? I'm still refining my yogurt recipe. What seems to work best is a mix of 3 1/4 cups grass-fed whole (cream top) milk and 1/2 cup half-and-half set over gentle heat in a heavy pot. I bring the milk up to just below the boiling point, or past 200 degrees Fahrenheit when the milk is just beginning to foam. This will take about 45 minutes. I then remove the pan from the heat and place it in the sink with cold water to bring the temperature of the milk down to 120 degrees, at which point I mix in about 2 tablespoons of last week's yogurt and pour the mix into a warm quart canning jar. The canning jar goes into a cooler with 2 jars of hot water and sits overnight. 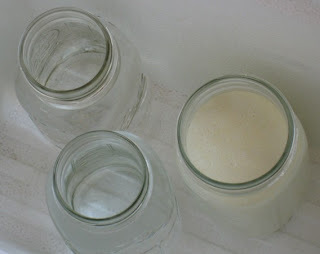 Cooking the milk at a high temperature concentrates the protein and results in a thicker yogurt. The amount of bacteria you put in the milk has no effect on thickness. The yogurt is actually set after a few hours. But I like to give the bacteria more time to create that delicious tang. 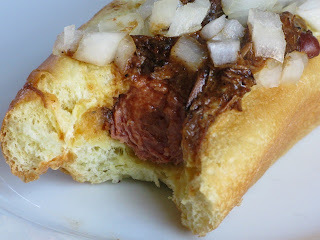 Hebrew National beef hot dog with homemade chili on a potato roll. The dog and the chili are leftover from our inaugural catering event. Oh, I am hearing the howls out there, the cries of "Foul!" Because there is nothing very sustainable here. In fact, I think it's a pretty safe bet that the meat on this bun came from a feedlot somewhere. In fact, the parent company is the evil ConAgra that we all love to hate so much. But this is a perfect illustration of how far the rest of the world has to go to catch up with the ethicureans. Tens of thousands of people were fed at events all over the District of Columbia beginning over the weekend. How many of the ingredients do you suppose were local or organic or sustainably raised? Believe me, even the most liberal people we know don't bother to ask where the food comes from at a party--even when they're the ones throwing the party. We are just starting to see the beginnings of food conscious hosts out there asking for politically correct menus. Most people would choke on the additional cost. So as professionals we consider ourselves to have feet in both worlds. We eat out of our garden, pastured eggs, grass-fed meats and dairy. But when we're cooking for others, we feel compelled to give them what they want, though for small affairs we can often sneak our home-grown products onto the menu. The Washington area isn't known for it's Cuban restaurants (that would be Miami). But at one time, back in my student days about a century ago, there was a great little Cuban place in the Adams-Morgan neighborhood here in the District of Columbia called The Omega. The wait staff consisted of older Cuban gentlemen with thick accents, all smartly outfitted in white shirts and black pants and possibly even white aprons. We'd go there when we wanted a delicious meal for cheap. I think a chicken casserole thick with meat and onions and peas was something like $4.95 and with that you got the standard sides, consisting of a bowl of runny black beans and a generous scoop of rice. But we always had to order a side of fried plantains, or platanos, because they were simply irresistible. I remember them being more on the sweet side than savory, lightly fried and somewhat delicate. What a taste, scooping up a sweet plantain while you still had black beans and rice in your mouth. You could never make something like that up, it had to come from the original cuisine. In any case, that's the image I had in mind when I decided to make fried plantains in our "food appreciation" classes this week. We don't normally cook with hot oil (I don't even want to think about an accident). But how can you travel around the Caribbean without eating plantains? So this week we are in Puerto Rico on our virtual world food tour making fried plantains and a simple dipping sauce. We are taking unusual precautions around our pan of hot oil so that the kids don't even get close. Our brief stop in Cuba last week reminded all of us how food binds the world together and sometimes requires us to think about many different issues, not just cooking but questions of culture, ethnicity, politics, history, ethics. I couldn't help pointing out that while Cuba lies only 90 miles off American shores, we have maintained for the last 50 years an economic and political blockade of that country simply because we don't like Fidel Castro or his form of government. We decry the Communist regime of Castro on the one hand, but meanwhile elevate another communist regime with a horrible human rights record--China--to the position of important trading partner and principal banker to the U.S.
"Hypocrisy...." I heard one of the kids mutter. "Why are you telling us these things?" another student asked. It all led to a very lively discussion of how food can take us to unexpected places and teach us more than just how to eat. For the completely uninitiated, a plantain looks like a big banana but harder and much starchier. Only toward the very end stages of ripeness do plantains begin to soften and taste mildly like a banana. Otherwise they are often used more like a potato or other starchy vegetable. They are often sold in supermarkets if you live in an area with any sizable Hispanic population. Or look for them in Latin groceries. Sometimes they will be separated into two types--plantains that are still green, intended for savory dishes such as casseroles, and the riper ones that are better for eating on their own. I'm not a plantain expert, but I'm told that in Puerto Rico they are commonly cooked according to a two-step process. First, remove the skin by using the tip of a pairing knife to make two or three slits lengthwise on the fruit. After removing the skin, cut the fruit crosswise or on an angle into fairly thick pieces, about 3/4 inch. Meanwhile, use moderate heat to bring about 1/2 inch canola oil in a heavy skillet to around 360 degrees, or a point where a piece of plantain placed in the oil will create fairly vigorous bubbles but not burn. Arrange the plantain pieces in the oil and cook until they are browned on both sides, using a pair of forks to flip them over. Remove the pieces to a plate covered with paper towels to drain. 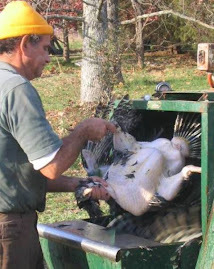 Allow them to cool for a few minutes before whacking them with a meat tenderizer or other heavy object. 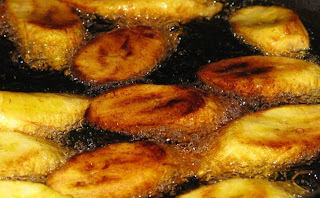 The intention is not to destroy the plantain pieces or turn them into chips, but simple to flatten them a little exposing some of the insides. You can do this between a couple pieces of waxed paper. Then return the plantain pieces to the hot oil and brown again. This second step will cook the plantain all the way through. For a dipping sauce, mix 1/2 cup sour cream with 2 teaspoons lemon juice and 2 teaspoons lime juice. Add 1/2 teaspoon chili powder and mix well. Enjoy picking up the plantain pieces with your fingers and dipping them into the sauce. You might need to make more. They are quite addictive. My favorite resource for authentic Texas chili is our friend Melissa Guerra and her gem of a cookbook, Dishes from the Wild Horse Desert: Norteno Cooking of South Texas. Chili in this part of the country is so simple a cowboy could carry the ingredients around in his saddle bag. A puree is made from dried chipotle and ancho chilies, then cooked with tomatoes, roughly ground beef, some ground pork and onion. The dried chilies impart great depth of flavor. Of course there is the usual controversy over whether beans have a place in this chili (Guerra thinks they do.) I love the dish for its pure honesty and lack of pretense. My wife, however, wanted to do something a little different for the All-American cocktail reception we catered for the inaugural. As usual, she turned to her kitchen bible, The New Best Recipe book from Cook's Illustrated. Their chili con carne is very similar to Melissa Guerra's, but calls for using dried chili powder, whole beef chuck and bacon. It's thickened with masa harina, the nixtamalized corn flour used to make tortillas. A nice touch, I think. This time of year as we approach Super Bowl Sunday, you'll see "chili ground" beef showing up in the market. It's a much large grind of beef specifically made for chili. Who knew? Using whole chuck roast, my wife decided to tear up the beef once it had been cut into pieces and cooked in the chili. 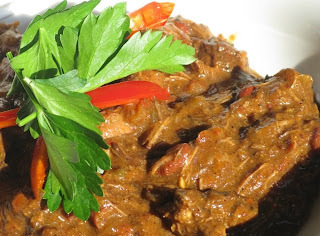 That helped incorporate the meat more thoroughly into the stew. But she ditched the bacon and I thought that was a good choice: I don't want bacon bits floating around in my chili. She also decided to put beans in the chili to bulk it up. She used small red ones, not the big kidney beans which I find a little too commercial. To toast the chilies, remove the seeds then place the fleshy parts in a hot iron skillet, about 1 minute on each side, until the color changes slightly and they become very aromatic. 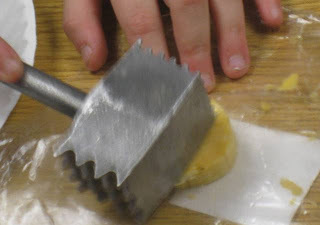 Allow to cool, then grind in a food processor. Mix the chili powders, cumin and oregano is a small bowl and stir in 1/2 cup of the water to form a thick paste. Set aside. Toss the beef cubes with 2 teaspoons of salt. Set aside. Heat 2 tablespoons olive oil (or bacon grease) to moderately high in a heavy pot or Dutch oven and brown the meat in 4 batches. Set the browned meat aside. Reduce the heat and add 1 tablespoons olive oil or bacon grease to the now empty pot. Add the onion and saute until soft, about 6 minutes. Add garlic and jalapenos and saute until fragrant, another minute or so. Add the chili mixture and cook another 2 or 3 minutes. Add the browned beef, crushed tomatoes, lime juice, prepared beans and remaining 7 cups water. Bring to a simmer and continue cooking at a steady simmer until meat is tender and juices are dark, rich and starting to thicken, about 2 hours. 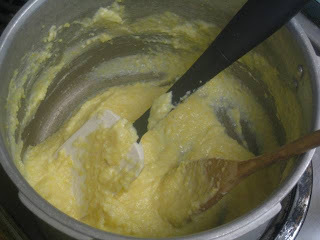 Mix masa harina with 2/3 cup water (or cornstarch with 3 tablespoons water) in a small bowl to form a smooth paste. Increase the heat to medium, stir in the paste and simmer until thickened, about 8 t0 10 minutes. Adjust seasonings with salt and ground black pepper to taste. You can serve your chili immediately with some slices of iron skillet corn bread. Even better, make the chili a couple of days ahead and let the flavors meld. 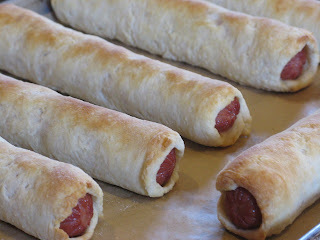 If you thought these looked like pigs-in-a-blanket on steroids, you got it right. They're Hebrew National hot dogs baked in biscuit dough, then cut on an angle into bite-size pieces and served with five different sauces. This was just one of my wife's clever innovations for an inaugural cocktail reception and open house for 100 that we catered yesterday. We were looking for an Obama-America theme (who wasn't)--some of his favorite foods that could be served on a buffet. So there was also chili and macaroni cheese served in tall ceramic shot glasses, our own Chicago-style deep-dish pizza that turned out shockingly well, small bites of sweet potato pie and an assortment of all-American cookies. When the crowd finally departed, we then served dinner for 20: Our favorite meat loaf and mashed potatoes. Here's wishing President Obama--and all of us--good luck and hearty appetite in perilous times. They call beans "the poor man's meat" because they are full of protein. But beans are not a complete protein. They're missing some essential amino acids that are readily supplied by animal sources such as meat or eggs or by simple grains. That's why you so often see beans paired with grains in cultures around the world. 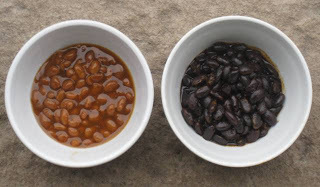 In Cuba, the next destination on the virtual world tour our "food appreciation" classes are taking, black beans and rice rank as a cultural icon. Add some fried plantains on the side and you have a meal that any Cuban would instantly recognize. Normally we would prepare our beans by soaking dried beans overnight in plenty of water, then cooking them with onion, bay leaf and thyme. 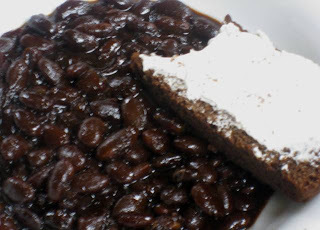 But for purposes of our classes, we used canned black beans from Goya, an excellent substitute. Simply scoop the beans into a colander and rinse with water. Cuban black beans couldn't be simpler. Just add a few common vegetables--onion, green bell pepper and red bell pepper--and a little cumin for flavor. 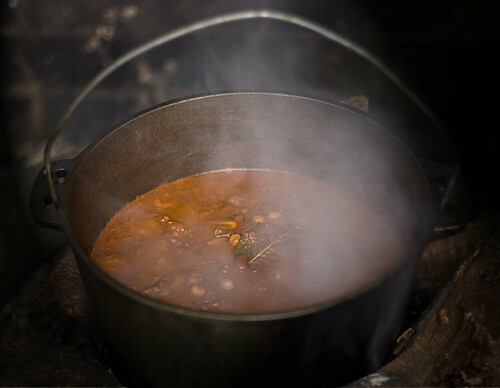 Yet the aroma of the beans simmering on the stove transfixes anyone who comes near and children quickly devour the finished beans with their meaty Latin flavor. To prepare the beans, cut a peeled onion into small dice. Add to it 1/2 large green bell pepper and 1/2 large red bell pepper, each cut into small dice, plus 2 cloves garlic, finely chopped. Heat 2 tablespoons extra-virgin olive oil in a heavy pot over moderate heat. Add the onion, peppers and garlic and season with 1/2 teaspoon salt. Lower heat to low and cook, covered, for about 10 minutes, or until the vegetables are soft. Empty a 30-ounce can of black beans into a colander and rinse thoroughly (or cook your own beans). Mix beans into pot with sauteed vegetables. Stir in 1 teaspoon ground cumin. Replace cover and cook about 40 minutes, or until the beans have started to give up some of their starch to create a sauce. (If the beans are too dry, add a little water.) Variations call for adding bay leaf, oregano, vinegar or olive oil to the beans. They all sound good, but they're not necessary. Some cooks like to mash some of the beans and add them back to the pot for a thicker sauce. White rice has become the default rice around the world, but that is strictly a matter of status. People came to consider white rice as more refined and cultured. Brown rice was for poor people. In fact, brown rice has it all over its white cousin because so much of the nutrition--fiber, vitamins, minerals--is located in the bran. Remove the bran and all you have a lesser-quality starch. We are trying to teach our students to avoid starches that contribute to diabetes and obesity. Quality brown rice has a wonderful chewiness and full flavor. I normally use a bulk brown rice from Whole Foods. But for these lessons I chose a long grain brown rice from Lundberg that cooked up big and fluffy--no clumping here. Just add the beans and you'll soon be serving seconds. Have I mentioned that my wife makes the world's best pizza crust? Thin crust, with a bit of whole wheat flour in the dough. She made several pies for daughter's 9th birthday. 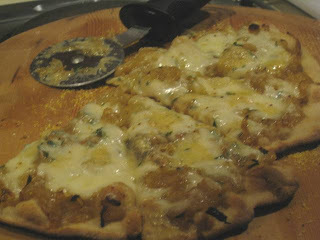 One of my favorites is this one with caramelized onion and blue cheese for the adults. The kids got mozzarella and pepperoni. For vegetables lovers there was the ever-popular broccoli variety. Pizza made at home is so easy there's really no reason to order out for it. We keep a pizza stone on the bottom rack of the oven full-time. Besides crisping the pizza crust, it helps regulate the heat in our old electric oven. Here's the recipe for the dough. There's a great move on to have the Obamas start a large vegetable garden at the White House. But do presidents even like vegetables? We know that George Bush the elder famously hated broccoli. George Washington apparently loved fish and nuts. Abraham Lincoln was so preoccupied with holding the country together that he paid hardly any attention to what he ate. But he was partial to a good cup of coffee, a simple egg and toast. Harry Truman,befitting his Midwestern roots, favored a big steak, cooked well-done, as well as fried chicken and custard pie. You can delve into all of these presidential food preferences in endless detail, along with much more about the White House culinary history, from a new web page posted by the Library of Congress. Titled rather dryly, "Presidential Food: Selected Resource Guide," the page lists dozens of written references--White House cookbooks, memoirs and food profiles of individual presidents--along with several internet links. You can even take a video tour of the White House kitchen with Executive Chef Christeta Comerford. One of my favorite quotes comes from our first president, who, despite the story about his admitting to chopping down the cherry tree, apparently really did like cherries but preferred his food simple. "My manner of living is plain, and I do not mean to be put out by it," Washington declared. " A glass of wine and a bit on mutton are always welcome. Those who expect more will be disappointed." What ever happened to mutton? Any chance it will make a comeback under the new administration? Steamed brown bread, a New England tradition, was a treat for us even growing up in the Midwest. We ate it out of a can (I never knew it any other way) and it was always something exotic and mysterious when it arrived on our dinner plate, almost on a par with getting chow mein carryout from the local Chinese restaurant. 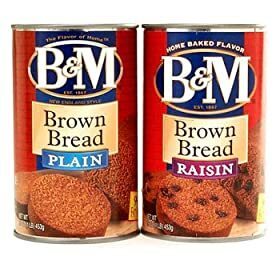 My memory is of the B&M brand of canned brown bread. This is a proud company from Portland, Maine, that first opened for business in 1867 and was canning corn long before it thought to can brown bread or Boston baked beans, the company's most important product. B&M has since been bought up by a succession of bigger food corporations over the years. But the brand and the factory still exist in Portland. The beans, cooked in open pots in brick ovens, come in a can as well as a jar uniquely shaped to look like a classic bean pot. Making steamed brown bread at home is simple, but the technique may be new to you as it was to me. Instead of baking in an oven, the bread cooks in a pot of boiling water, usually in some sort of tin can or similar mold. (You can even make it in a flower pot). To get the can, I had to buy a pound of coffee at the supermarket. We don't normally get our coffee in a can anymore. Then, after I had mixed the batter, I found that the recipe I was following in Aliza Green's The Bean Bible was much more than enough to fill the 1-pound can she called for. I see now that James Beard, who included an almost identical recipe in Beard on Bread, called for "cans," plural. An iconic New England food, steamed brown bread typically calls for three types of whole-grain flours, starting with rye flour, corn meal and either whole wheat, graham flour, oat flour or, in my case, since it was what I had in the pantry, barley flour. The batter must contain molasses--a staple ingredient in bygone New England--to give the bread its distinctive color and sweetness. Baking soda and buttermilk react to give the bread its rise. Traditionally, it can be made plain or with raisins. If you are using coffee cans to make the bread, you'll need to grease the inside or line them with parchment paper. You'll also need a tall pot ( or pots) to steam them in, with a wire rack or empty tuna cans or something similar (I used stainless baking rings) to put at the bottom of the pot so that the bread is not touching the heat source. Since I only had one coffee can, I improvised at the last minute with a small, high-sided cake pan. It worked just as well. Either way, the mold should be covered with a double layer of aluminum foil tied securely with a length of butcher's twine. To make your bread, mix together 1 cup rye flour, 1 cup cornmeal, 1 cup oat flour (or substitute barley, whole wheat or graham flour), 2 teaspoons baking soda and 1 teaspoons salt. 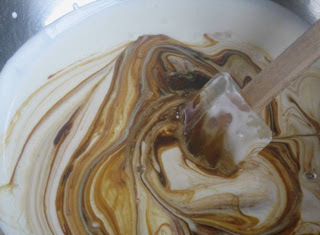 In a separate bowl, mix together 2 cups buttermilk and 3/4 cup molasses. Pour the buttermilk mixture into the dry ingredients and mix well. Pour the batter into 2 greased, 1-pound coffee cans (I used spray canola oil) or molds lined with parchment paper. Each can should be about 2/3 full. Place the cans into tall pots with a wire rack or empty tuna cans on the bottom. Fill the pots with water to a depth halfway up the side of the bread can (or mold). Bring water to a boil, reduce heat and continue boiling for about 2 1/2 hours, or until a skewer inserted into the bread comes out clean. When the can is cool enough to handle, simply remove the foil, invert the can and tap the bread out onto a cutting board. You may have to use a thin knife initially to separate the bread from the inside of the can. Note: Aliza Green suggests cooking the bread 2 1/2 to 3 hours. Meanwhile, James Beard calls for cooking the bread 1 1/2 to 2 hours. Quite a difference. We cooked ours for2 1/2 hours and it seemed fine. If two loaves seem like too much, cut the recipe in half and just make one. My wife thinks the bread gains from sitting a day or two before being eaten. We agree that the only way to serve it is with a generous slather of cream cheese and preferably a bowl of Boston baked beans. Boston baked beans and steamed brown bread spread with Philadelphia cream cheese. Isn't this a dinner we all grew up with? The memory leaped to mind when I went searching for bean recipes yesterday. It's high time The Slow Cook gives more attention to legumes, meaning dried beans of one sort or another. Beans are packed with nutrition, and one of the best sources of calories. No fat, lots of fiber. What more could you ask for? Plus, you can easily grow them in your home garden, even right here in the District of Columbia, about a mile from the White House. I cracked open my copy of The Bean Bible, by Aliza Green. It's overflowing with excellent background information about beans. Unfortunately, the first three recipes I tried were failures in one way or another. Not by a little. By a lot. Green's recipe for Boston-style baked beans, for instance, took me at least 10 hours to cook. There was simply too much liquid in it. Mea cupla for assuming that a "bean bible" is actually the last word. I have since returned to my library and done some additional research. Fact or fiction: Beans need to be soaked before cooking. Some cooks insist on soaking beans to make them more digestible,or simply to reduce the cooking time. I usually soak mine overnight. Green advocates a hot soaking and a pre-cooking process, wherein 1 pound of Great Northern beans are brought to a boil in 8 cups of water and cooked for 2 minutes, then taken off the heat and allowed to soak for 1 hour. The beans are then drained, covered with another 8 cups of water, brought to a boil and simmered for 1 hour. All this before any other ingredients are added. Meanwhile, The New Best Recipe, the kitchen tome put out by Cook's Illustrated, says their numerous trials showed that soaking or pre-cooking is completely unnecessary. Fact or fiction: Salt added too early to beans will toughen the skin, preventing them from absorbing liquid. Aliza Green contends that both salt and sugar have the toughening effect. Hence her convoluted process of pre-soaking and pre-cooking her beans. Harold McGee, meanwhile, writing in his seminal On Food and Cooking, says salt does slow the absorption rate somewhat, but that beans pre-soaked in salted water actually cook faster. Furthermore, acids and sugars strengthen the cell walls of beans. Hence molasses--with its classic mix of acid and sugar--is particularly good at helping beans keep their shape during a long cooking process. Boston baked beans traditionally start with a small white bean (smaller than Great Northern, but that's what I had in my pantry), along with molasses, dark brown sugar, dry mustard and salt pork. These are all classic ingredients that permeate the cuisine of New England. How to finish the beans becomes a matter of taste, and deciding how much of each ingredient to use. The baked beans I made following Aliza Green's instructions eventually turned out fine--a dense mass of dark beans with a strong molasses flavor. They were much closer to the baked beans I remember from childhood than the beans from a can of Bush's Boston Recipe Baked Beans, which to me tasted like ordinary beans. (But then Bush's Beans hail from Tennessee. What do they know about Boston baked beans?) You can see the difference in this photo--my beans on the right, Bush's beans on the left. I like the Best Recipe approach, which offers some simple refinements to the classic recipe. For instance, they added diced onion for flavor (Aliza Green calls for placing a whole onion studded with cloves in the bean pot). Also, they suggest cubing the salt pork and browning it before mixing it with the beans. Again, more flavor, compared to the traditional method of simply laying a scored slab of salt pork on top of the beans. They prefer using prepared mustard rather than dry mustard on grounds that most home cooks are more likely to have a jar of prepared mustard on hand. And they like a bit of cider vinegar added to the mix to cut the sweetness of the molasses. So where does that leave us? I'm not exactly sure, since I liked the end result of Aliza Green's method, but I would gladly incorporate some of the suggestions from Best Recipe. If you pre-cook the beans as described above, proceed by lightly browning 6 ounces salt pork, trimmed of any rind and cut into small cubes, at the bottom of a heavy pot or Dutch oven. Add 1 onion, finely diced, to the pot and cook until the onion is soft, another 8 minutes or so. Remove from heat, skim off excess fat and reserve. In a large bowl, mix 3/4 cup molasses with 1 1/2 cups dark brown sugar, 1 1/2 tablespoons prepared brown mustard, such as Gulden's, 1 tablespoon ground ginger, 1 teaspoon salt, 1 1/2 teaspoons ground black pepper and 4 cups water. Pour the prepared beans into the pot with the salt pork and onion. Mix well. Add the molasses mixture,which should easily cover the beans. If not, add more water. Cover the pot and place it in a pre-heated 300 degree oven and cook for about five hours, or until the beans are almost cooked through, adding water to the pot from time to time as needed. Remove the lid, stir the beans, and continue baking until the beans are completely tender and all of the liquid has been absorbed or cooked off. What you should have is a thick muddle of beans, not a sloppy bean soup. If necessary, continue baking with the lid off until any excess liquid is eliminated. Finally, stir in a tablespoon of cider vinegar. If you do not pre-cook the beans, Best Recipe calls for adding 9 cups of water to the molasses mix and cooking for 4 hours, then removing the lid and baking another 1 hour. Note: Cooking times for these baked beans are all over the map. I consulted all of my New England cook books, as well as the Fannie Farmer Cookbook (Farmer, a real person, ran the Boston Cooking School for a time around the turn of the 20th Century). Most call for a cooking time of six or seven yours. Be your own judge. But enough of how I bake my beans. Let's return to the original question: How do you bake yours? Tomorrow we'll be looking at steamed brown bread. It's hard to beat the stuff out of a can for childhood memories. But if you can't find it at the store, you can make your own. The crab fishery has been declared a disaster in the Chesapeake Bay and crab is hardly seasonal this time of year. But most catering clients don't give a lick about sustainability or seasonality. Hence, it's possible to end up with a leftover pound of crab meat in the fridge, probably from someplace in Southeast Asia purchased at Costco. In our case, there was no choice but to invite friends over for my wife's superb crab cakes. I could not think of any way to turn this into a winter menu, we just followed our best instincts and made some of our favorite three-hour braised green beans and the cheese grits we've been focused on this week. Naturally, I received a thorough thrashing from my wife for purchasing green beans in January. Oh, the ignomy of it all. Mea culpa. The secret to successful crab cakes is to handle the meat as little as possible. In Crisfield, Maryland, for instance, once the world's crab picking capital, a crab cake likely as not will consist of a pile of choice lump meat barely breaded and placed under a broiler to brown. Most cook's ignore this tradition or are completely ignorant of it. That's why so many crabcakes you see in restaurants have the density and resiliency of a hockey puck that has spent too much time in a deep fryer. My wife's method is to combine 1 pound of lump crab meat with 1/2 cup fresh bread crumbs--that usually means a couple of dinner rolls pulled into small pieces. Combine with 1 beaten egg, 2 teaspoons Dijon mustard, 1/2 teaspoon worcesterhire sauce, a tablespoon chopped parsely, a dash or two of Tabasco and salt and pepper to taste. Gently toss all the ingredients together and let the mixture sit in a bowl for an hour or more. This will help the cakes hold together in the cooking and give the flavors some time to meld. Next, pour canola oil into a heavy skillet to a depth of about 1/2 inch and heat to medium high. Gently form the crab mixture into 4 jumbo puck shapes, or 5 or 6 large cakes. Place the crab cakes in the hot oil and brown on both sides, turning them gently with a slotted spatula. Remove the cakes to paper towels to drain, then arrange them on a baking sheet and place in a 300 degree oven for about 15 minutes to cook through. For her tartar sauce, my wife mixes mayonnaise with a bit of finely chopped red onion, some chopped capers, pickle relish, a little juice from the pickle relish jar, and some Old Bay seasoning. A lot of chefs claim to have secret methods for making crab cakes but this one is better than any other I've seen. The green beans, cooked to death, come to the plate dripping their magical, fennel-scented broth, which runs into the cheese grits to make a delicious muddle. We washed the whole thing down with a wonderful Vouvray wine. Unless you happen to have a pound of crab meat in your refrigerator already, however, do give the crabs a break and wait until summer to enjoy this meal. The movie "My Cousin Vinny" gave us a classic laugh line when actor Joe Pesci, playing a New Jersey lawyer confronting breakfast in the Deep South, asks: "What's a grit?" There's still some confusion over whether "grits" should be treated in the singular or the plural. But there's no mistaking where grits come from. They are ground corn, familiar as the indigenous grain to early Native Americans who passed them along to the first white settlers. Grits remain a staple of Southern cuisine. The Indians soaked dried corn in lye, removing the tough shell or pericarp to produce large, soft kernels called "hominy." The large pieces could be ground into tiny grains we now call "grits." But it gets very confusing, because now grits are widely made from untreated corn but still called "hominy grits." You can still find grits made the old fashioned way--dried corn ground between huge granite wheels. The process results in a fine powder, sold as corn meal, as well as the larger grains, sold as grits. These grits usually take an hour at least to fully cook and are considered by some the only proper kind of grits to serve. Otherwise, the grits sold in supermarkets under the Quaker Oats and other brands have been further processed to cook in as little as 20 or even 5 minutes, in the case of "instant grits." But be warned. Instant grits may taste more like library paste if you are used to the real deal. Being from Chicago, grits were utterly foreign to me until I moved to the District of Columbia. In my student days, about a century ago, I worked at a federal job that started each morning before the crack of dawn. Our first break was breakfast. I recall musing over the strange mush I saw next to the scrambled eggs on the steam table in the cafeteria. I remember thinking it looked vaguely like cream of wheat. That, I was told, were grits. Sadly, I never really developed a lasting taste for grits. A pity, because they can be truly delicious if made carefully and slowly in the traditional manner. In the South, grits are a virtual staple, served with ham and smothered in gravy. But grits are not just breakfast food. Shrimp and grits have risen to a fine art, suitable for the finest restaurants, in Charleston. Add eggs and they can become a sublime souffle. 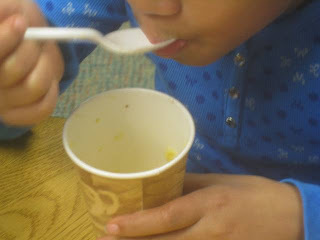 While we are roaming around the South on our virtual world food tour, our "food appreciation" classes sampled old-fashioned grits seasoned with cheese. We used the yellow corn grits sold in bulk at the Whole Foods. Some cultures disdain yellow corn as unfit for humans. They insist on white corn. But I must say I don't detect any difference in taste. First, soak 1 cup of fresh grits in a large bowl of water. Stir the grits at the bottom of the bowl. This will bring the tough bran from the milling process to the surface of the water where it can be swept away with a strainer. Meanwhile, heat 2 cups of water with 2 cups of milk in a heavy saucepan over moderately low heat. Strain the grits and add these to the pot. Cook very gently for about 1 hour, stirring frequently so that the grits do not stick to the bottom of the pan and burn. Slowly the grits will absorb the liquid, swell and become thicker. Add more milk if desired. When the grits have reached your desired thickness (not thin and runny, but not thick enough to mound either), remove from the heat and add about 1 cup grated cheddar cheese. We used a yellow Vermont cheddar. Stir until the cheese is fully incorporated, then season with salt as needed. You can also add butter and/or cream if you like. But we thought our grits were perfectly delicious as is. With our grits, I showed the kids how to cook bacon in the oven. I almost prefer bacon out of the oven to that fried in a skillet. It always comes out flat and pleasing to the eye--not all curly and wild--and it's so much easier to cook a large quantity on a baking sheet than on the stove top. We covered the baking sheet with parchment paper to prevent the bacon sticking. Cleanup is a breeze. Do you keep a jar of bacon grease? There was a time when I stopped, thinking the pork fat would kill me. But I'm back to saving it, especially from the good Niman Ranch pork we get at Whole Foods. New Year's seems to be a time of lists--what's in, what's out. 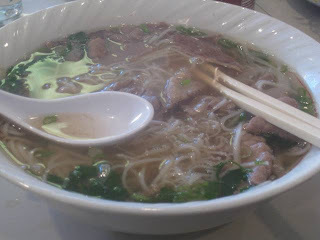 If you put a gun to my head and forced me to make a list of the world's greatest foods, this would have to be near the top--the simple Vietnamese noodle soup called pho (pronounced fuh?, like a question). You know you are in a great pho house when you walk in the door and are transported by the aroma of star anise. The subtle broth is full of exotic spices and the essence of lots of beef bones, making it pure peasant fare. In its country of origin, pho is street food eaten any time of day, a snack that will keep your belly happy and full until tomorrow. Typically it also contains some beef parts--the less expensive kind you don't see very often in restaurants. Squeamish diners stick to thin slices of shoulder or eye of round, but I like to see mine swimming with bits of tendon and tripe and fatty brisket. On the side you'll be served a plate piled high with bean sprouts, Thai basil, sliced jalapeno and lime to add to the soup as you desire, along with squeeze bottles of sweet Hoisin and scorching Sriracha pepper sauces. We also order a small bowl of pickled onions. The suburbs outside the District of Columbia have one of the largest Vietnamese populations in the country, so there's no problem finding good pho here. At $7.25 for a large bowl (prices have gone up lately), it's hard to beat for price, which may explain why you see so many non-Vietnamese immigrants lining up for pho. I'm not naming the restaurant where we took our pho yesterday because I had the distinct impression there was less meat in it than customary. Sign of the times? But still, oh so good.